In the past, I've separately experimented with both the Microsoft Surface and the Kinect sensor, so was interested to see that Evoluce have recently combined the two technologies with the release of the Evoluce Two device. 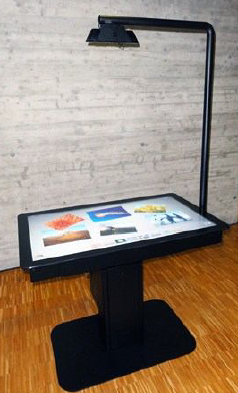 It consists of a 46 inch multi-touch LCD display and a Kinect sensor positioned 100cm above the screen. Evoluce Two can detect more than 60 simultaneous inputs and supports up to 4 users at a time. The 3D depth sensing technology of the Kinect can also be used to determine when objects are placed near to, or on, the screen surface. Evoluce Two uses an NEC MultiSync LCD panel, providing a resolution of 1920 x 1080 over an active area of 1018 x 572 mm. The Evoluce MIM 3D v3.0 software is the touch input recognition software used to provide a fully collaborative multi-user environment and is designed for Windows 7. Applications can be developed using the SDK for the Microsoft Surface 2.0 - which allows you to run applications developed for the Microsoft Surface directly on the Evoluce Two. Looks like an interesting competitor for the Microsoft Surface 2, and will retail for Euro 4995, including software. PS. On a separate note, also check out their gesture control software for the Kinect and Windows 7, Win&I, which uses the OpenNI NITE Kinect Sensor software to control Windows 7 applications using gestures interpreted by the Kinect.